Ah! the question of where to plant the bulbs that one has ordered, I’ve been planting tulips this week and even though I did write a list of where they were to be planted, somehow there were far to many and more places had to be found. I do hope your Anemones will do better than last year. If they look very dry you could soak them in water overnight before planting, it is supposed to help stimulate growth. Thanks for the tip Christina. They do look rather dry so I’ll soak them first. The planting guide said it’s hard to tell top from bottom on these bulbs so plant sideways. Brent and Becky are great folks and their bulbs are tops! Enjoy! Have heard many nice things about this couple. Someone took the time to write “Enjoy” at the bottom of my packing slip. I think they mean it. Hoping the ground dries for you. And that the spring brings you the joy you are working for. Happy Thanksgiving. Thanks. Still pouring but from experience I know it won’t rain forever. Happy Thanksgiving to you John! I always manage to find space for a few more, and not all of last year’s will come up either… have fun planning and hope you get some dry planting weather soon! Thanks Cathy! That is a nice thing about bulbs–they’re easy to tuck here and there if necessary. Woodstock is a beautiful colour Susie, I have been trying to find some for here, but fear I’ve left it too late. We saw them planted en masse whilst visiting Sweden last spring and they were really eye catching. I had a delivery this morning of Tulips bought on a last minute purchase, but like you it was too wet to plant. Planting bulbs has an excitement of its own. Tulips will be lovely for spring Julie. Deer are too fond of them here so I haven’t tried them in a while but I love them. Hope you can locate some Woodstocks, maybe even on sale now. Good luck with planting your bulbs. I prefer transplanting sprouted bulbs since almost all the bulbs I’ve planted become squirrel or chipmunk food. The only survivors are the ones that I protect with chicken wire. I envy those who can put in bulbs and wait to see them flower in spring. We just have too many ravenous critters on the loose. Critter problems are difficult to address. We have a bad vole problem so I wondered about using some wire mesh along with the bulbs, but I’ll probably just take my chances. I have not tried transplanting sprouted bulbs, but might try that with a few. Your spring colors should be quite spectacular…I am looking forward to see the photos. Definitely, lots of pictures. Those rich colors should wake up the garden. Our ground is absolutely sodden at the moment so I am planting my bulbs in pots then I can see where to plant them when they sprout. There are so many in the ground anyway, at least this way I will know where there are any spaces and I won’t slice them in two when planting new ones. That’s a great idea Pauline. I might try that for part of my bulbs too if I can’t get them planted today. Hope your area gets some relief from rains. I hope the anemones do better this year, they’re another plant which won’t grow up here and I hope to live vicariously through your blooms! I love the darker hyacinths, I planted a few a couple years ago and they really make a nice contrast to all the yellows and pinks of spring. Hope to make you proud with the anemones! Suddenly feeling pressure to get them planted in a nice, photogenic spot! I planted deep orange hyacinths the year we moved here and they were great, but didn’t last long. 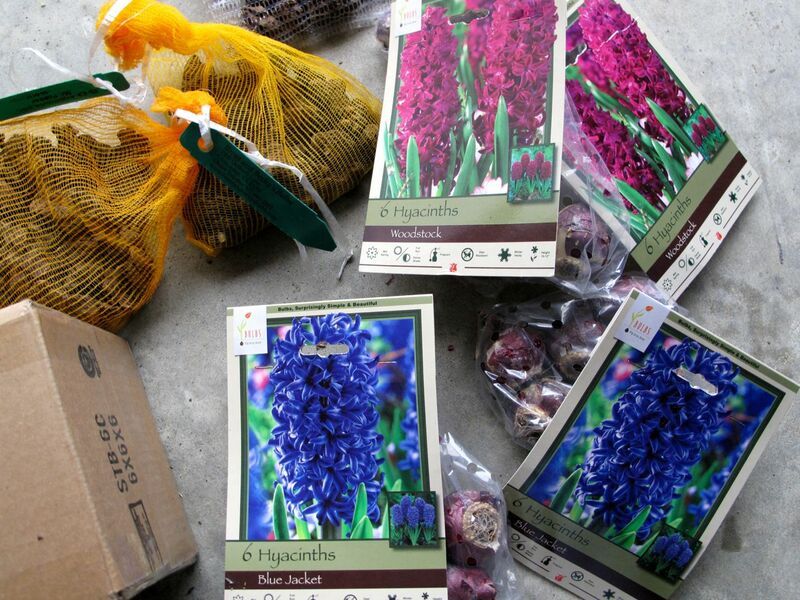 Oh my, that is a lot of bulbs but your readers are sure going to enjoy some wonderful photos come spring. 🙂 We’ve got 8″ of heavy, wet snow today with some large branches down. Happy Thanksgiving. Happy Thanksgiving to you too. Will do my best to show some colorful bulbs blooming this spring Judy. Hope the branches didn’t damage anything. There was snow in the western part of NC but we just had lots of rain here. I hope you’ll come up with a solution, poor thing. I also planted anemones and they looked a bit dry so time will show. Hope the soil dries up for you! Thanks Annette. 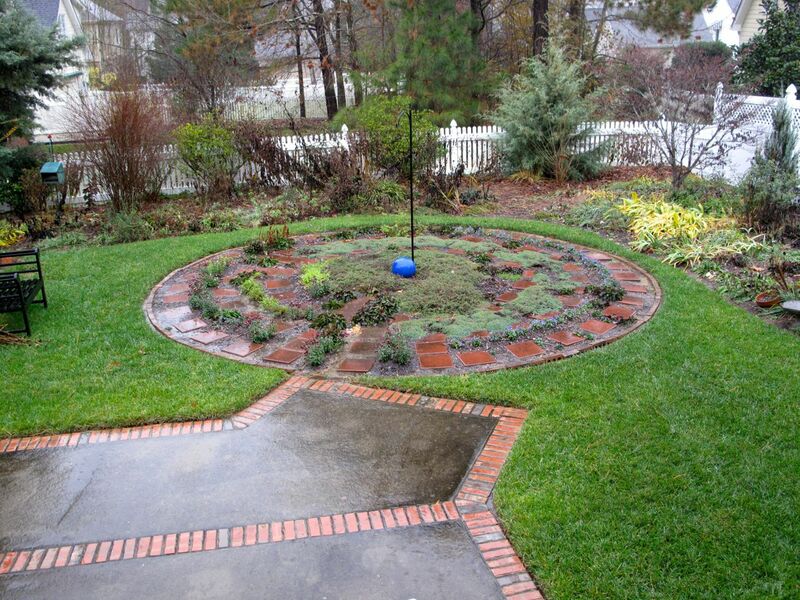 It stayed too wet today to plant bulbs and even rained more, but it’s supposed to clear soon. I’m going to try soaking the anemones before planting just in case. I ordered from Brent and Becky’s, too. :o) Hyacinth need really sharp drainage. Mine died last year because the spot I put them in stayed too moist. Those anemone will be really pretty. Thanks for the tip about drainage for the Hyacinths. I’ll have to reconsider where I can place them. Brent and Becky’s seems to have quite a following. Was very pleased with my order. Good luck with your bulbs this year too! Something to look forward to! Very colourful selection. Haven’t bought many bulbs in a while so it’s fun to anticipate how they’ll look in spring. I planted ‘Blue Jacket’ last year. It’s lovely, though not as fragrant as I hoped. This year I planted a yellow variety of hyacinth called ‘City of Haarlem’. Garden bulbs are a nice surprise. Usually I surprise myself with something I have forgotten to do. Brent and Becky’s is a great bulb vendor with an amazing selection. I can’t wait to see where you planted all these wonderful bulbs…spring will be even more beautiful in your garden next year.